We had found two areas of the world that seemed to comply, eastern Canada and southern Tasmania. There were some nice sea- and lake-front properties up near Halifax, where we reasoned that the economy, which has been in a bad way since the crash in fish stocks some decades ago, might recover if global warming caused the North West Passage to open up and container ships started coming ‘over the top’. On the other hand, we don’t like Canada’s tax laws, but are already subject to Australia’s, so we had a closer look at Tasmania. Down in the far south of the island state, much of the land facing the d’Entrecasteaux Channel has been (at least theoretically) subdivided into rural plots. 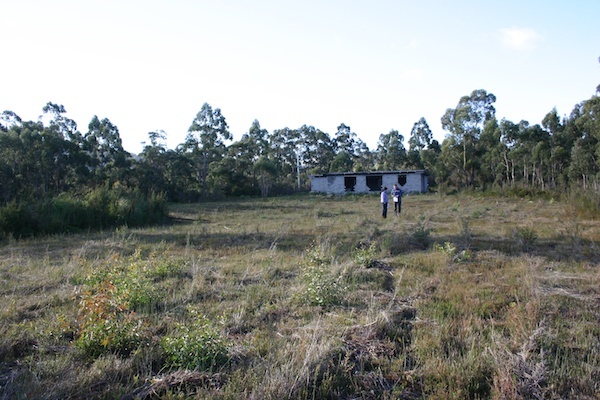 Over the last hundred years there have been several attempts to build new bush towns down there, and the councils hold maps with named roads and numbered plots, but development never kicked off and there is no sign of this on the ground. 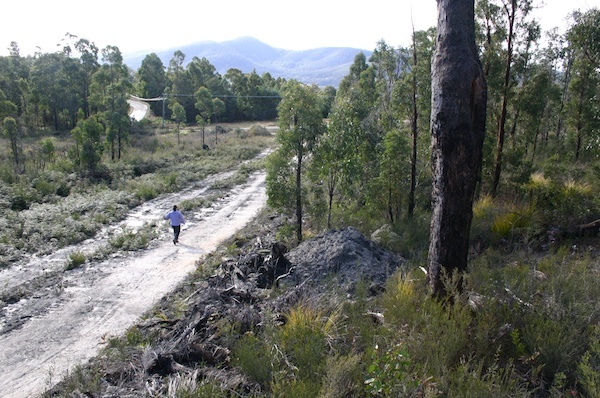 Mainly it’s all unmarked post-logging new-growth forest. However, the plots exist as legal entities and are all owned by somebody, typically by a local resident who bought them up as an investment. Now those residents (or their descendants) are passing away and willing their land to their children. However, Tasmania has moved on and those children don’t want to live on the land, they want to make their fortunes in the big cities on the mainland. Many of these plots are now up for sale, as those children try to cash up and move on. Having drawn up a short-list of some half-dozen candidates, we flew to Hobart, hired a car, and spent an enjoyable rainy weekend stomping around in the bush with an obliging agent from Tasmanian Private Realty. At the end of a long but very interesting day, we arrived in Lymington where there were three connected plots for sale. It was almost dark as we clambered around in the damp undergrowth, but we liked what we saw and decided to return again next morning. We were up bright and early and, after breakfast in the pleasant local town of Cygnet, drove out to Lymington. 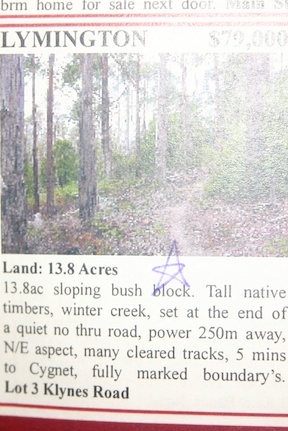 There was an old logging track that led past Lots 1 and 2, which then petered out before reaching Lot 3. All were for sale. Lot 1 was on the flat with some pasture, Lot 2 sat at the bottom of the hill, and Lot 3 ran up the hill to the top. As was usual with these kinds of plot, there were no fences or border markings of any kind. We were drawn to Lot 3. It has the advantage of sitting at the top of the hill at the end of a blind road, so it would be very private. 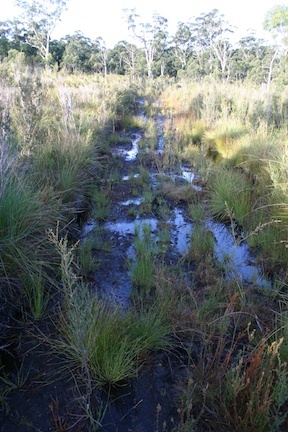 The border with Lot 2 is marked by a winter creek. The other three sides of the square border forestry land, and when I rang the council to see if they had any plans for it, they told me that there it was such a thin inaccessible band that it would never be worth anybody’s while to log there again. There is a good covering of different trees of different sizes, and the undergrowth is thin enough to allow access to the whole property. The rural zoning means that we can build a house or not, as we feel fit. As a bonus, Copper Alley Bay at the bottom of the hill has moorings for deep-keel yachts, and – as residents – we would be able to put in our own mooring for a minimal fee. The nearest town, Cygnet, has shops and pubs and a hardware store, as well as some nice little restaurants. We think we’ve found our new home. 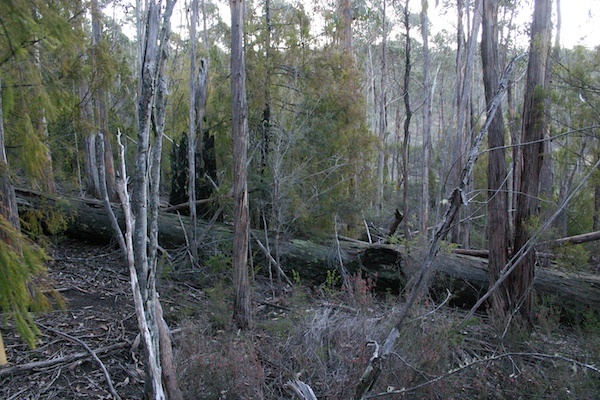 This entry was posted in A Forest in Tasmania, Australia, Travel on 2007/07/15 by Reinhard.